Loan Out Corporations – To be or not to be? With the passing of the Tax Cuts and Jobs Act of 2017, many actors, writers, directors, and other professionals in the entertainment industry will likely see their taxes increase beginning in 2018. The entertainment professionals who earn wages are being hit the hardest because employee business deductions will no longer be allowed in 2018 going forward. Prior to the passing of the new bill, entertainers receiving a W-2 were able to deduct the costs for their union dues, agent commissions, talent managers, accountants, attorneys, and other ordinary business expenses. Altogether, those business expenses typically add up to roughly 20 percent to 35 percent of an artist’s income but will no longer be deductible going forward. The disallowance of these expense deductions will have a particularly negative impact on the entertainment industry. In light of the new tax reform changes, many accountants are advising their entertainment clients to form a loan-out corporation in order for them to deduct their business expenses. Under a normal employment arrangement, a movie, TV show, or theater production would hire the individual actor, writer, or director. Under a loan-out arrangement, the individual would incorporate and set up a loan-out company. 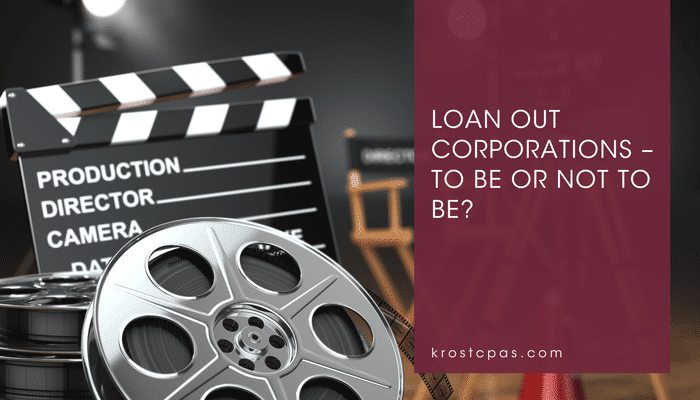 The loan-out company would employ the individual and “lend out” their services to the movie, TV shows, or theater production. Prior to the enactment of the Tax Cuts and Jobs Act of 2017, the main benefit of the loan-out corporation was full benefit of the business expenses otherwise limited on the personal returns, as well as avoiding the alternative minimum tax. Under the new law, loan-out corporations remain unaffected whereas entertainers receiving a W-2 can no longer deduct any business expenses to offset their income. While a loan-out corporation seems like a great alternative to mitigate the increased tax burden for entertainment professionals, it may not be the best solution for everyone. Entertainers must consider the costs associated with incorporating, which include attorney fees to set the entity up, bookkeeping fees, corporate tax return preparation fees, a minimum $800 corporate franchise tax per year (for California residents), and additional payroll taxes, which include the employer’s portion of social security taxes (as high as $9,800 or 7.65 percent of wages paid up to about $128,000) and $300 to $400 in Federal and state unemployment taxes. The additional costs of incorporating may offset any tax benefit received and government compliance can be an administrative burden for the entertainer. By forming a loan-out corporation, an entertainer is also forfeiting their opportunity to claim unemployment. However, higher earning individuals can take advantage of a loan-out corporation to make tax deductible pension contributions, so the decision depends on the individual’s situation. Many entertainers who are currently paid as employees will likely be hit with an increase in their taxes beginning in 2018. For entertainers who are considering whether to set up a loan-out corporation, be sure to weigh the increased costs to do so against the potential benefits. It may not make sense for lower to middle income earners. Since every entertainment professional’s situation is different, they should consult with their tax advisor before making a decision. » Contact us today. Authors: Jonathan Louie, CPA & Douglas Venturelli, Esq. If you have questions regarding our tax services, schedule a call today.